This fall M&Ms is adding one of three new peanut flavors to its lineup. Much like the presidential race, they’re asking folks to eat each one and vote for which tastes best. Which one gets my vote? Now I may not know much about how the American political process works, but I do know chocolate covered peanuts in a colorful candy shell. When I was a small boy I preferred plain M&Ms. When I was a small boy I was kind of stupid. Peanut M&Ms are the best. It’s partly about the taste, the way the peanut tempers the chocolate sweetness. But it’s mainly about how one can bite half the chocolate/shell combo off and pretend the remaining candy is the exposed core of a tiny planet. Maybe that’s just me. Do we need a new peanut M&M flavor? I can say with the utmost certainty that I dunno. We’ve got three. Let’s eat them. Before I give a brief synopsis for my non-video-speaking friends, we need to understand the stakes involved. One of these three flavors, voted on by the public, will become a permanent addition to the M&Ms roster, while the other two will only be trotted out for special occasions, probably. One of the voters will win a bunch of cash, as well as the title of Official M&Ms Taste Tester. You cannot call yourself Official M&Ms Taste Tester unless you win the sweepstakes. Go ahead, try it. Say “I am an Official M&Ms Taste Tester.” Yeah, go ahead and feel good about yourself. You won’t been feeling so good when M&Ms’ jackbooted thugs kick in your door five minutes from now. Better read fast. The most requested peanut M&M variant, honey and peanuts go together like bees and whichever bug is responsible for making peanuts. I think it’s the peanut spider, weaving pattered shells with its nutty spinnerets. Sometimes it puts its babies in there. Colored yellow and black to emulate that girl from the “No Rain” video, honey nut M&Ms walk the line between too sweet and just right. Adding honey to something already sweetened with chocolate is a delicate balancing act, and M&Ms’ scientists nailed it. Still, it is sweet on sweet, and the slight shot of fresh honey flavor doesn’t do much to distinguish itself. I’d prefer a taste that’s a bit more unique to the M&M world. But M&Ms doesn’t do anything small, and its source is the entire world. Does that mean the quality isn’t as good as the chocolate you pay $10 per bar for at the farmer’s market? God, I hope so. Otherwise I’ve been wasting a ton of money. Chili nut M&Ms are regular peanut M&Ms with a mild burn. There’s no difference to the overall taste. It’s just peanut M&Ms plus heat. I went through the entire bag trying to detect a taste difference, but there really wasn’t one. The burn is novel, but just that. I had higher hopes. I was not looking forward to coffee nut M&Ms. I’m not a coffee drinker. There is a very particular way I enjoy roasted bean juice. If the flavor is not the perfect balance of bitter, sweet and cream then I’d rather not drink it. It’s difficult to achieve. Unless you’re an M&M scientist, apparently. Coffee nut M&Ms are what I was hoping chocolate-enhanced coffee would taste like on the rare occasions I’ve ordered it. A wonderful marriage of dark and bitter and bright and sweet. 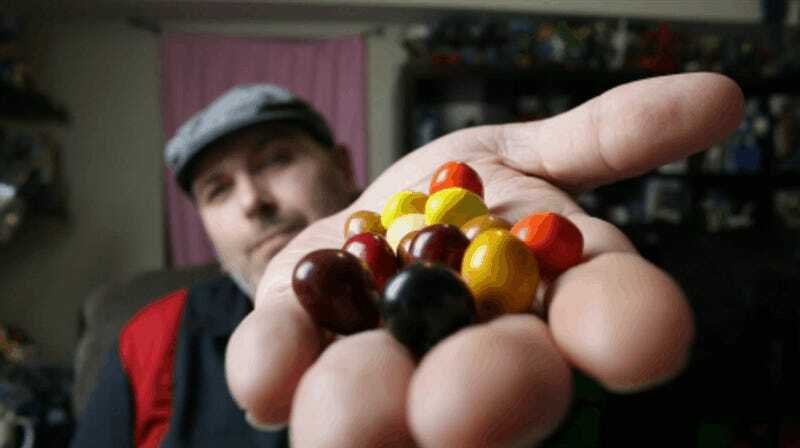 I’ve had plain coffee M&Ms in the past and felt overwhelmed. Here the peanut acts as a sentry, keeping the chocolate and coffee in check while adding a mild nutty tone. Ladies and gentlemen, I give you the next president of the United States.